Despite large and persistent gaps between blacks and whites on virtually every indicator of economic well-being, about half of all whites say the average black person is about as well off financially or doing better than the average white person, according to a survey released last week by the Pew Research Center. The survey found that 53% of whites say that, on average, blacks are “about as well off” financially as whites (43%) or say blacks are doing better (10%). But when you ask black Americans the same question, about six-in-ten blacks (59%) say, on average, blacks are worse off financially than whites. 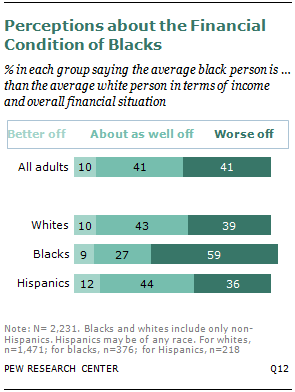 Among blacks, about a third (36%) say the average black person is doing better or about as well off as the average white person. So how does perception square with reality? On the eve of 50th anniversary of Martin Luther King’s historic “I Have a Dream” speech, decades of government data finds that blacks have consistently lagged far behind whites on most indicators of economic well-being. If anything, the gaps on some key measures have grown over the years. For example, the median household income of a family of three in 2011 was $39,760 for blacks but $67,175 for whites. That’s a difference of about $27,000, up roughly $8,000 since 1967. The race gap between blacks and whites on median household wealth, measured in terms of net assets minus liabilities, has increased as well, from $75,224 in 1984 to $84,960 in 2011. During this period, the median net worth of an average black family actually declined slightly from $7,150 to $6,446. One big reason for the wealth gap: Blacks are significantly less likely than whites to own their own homes (44% vs. 73%), and a home comprises the bulk of most family’s net worth. Blacks also were about three times as likely as whites in 2011 to be living below the poverty line (28% vs. 10%). This gap has remained about the same in recent decades. Perceptions of how blacks and whites are associated with other views on race. For example, about six-in-ten (58%) of those who say blacks are doing worse also say the country needs to make “a lot” more progress to achieve equality between the races, a view shared by 43% of those who say blacks are doing the same or better than whites.